The production and distribution of natural gas presents operators with substantial logistical, safety, and physical challenges. Maintaining flow control, containing, and dispensing of natural gas, CNG, and LNG are hazardous endeavors requiring special equipment configuration throughout the supply chain. Source and pipeline operations are faced with high pressure and extreme working environments. 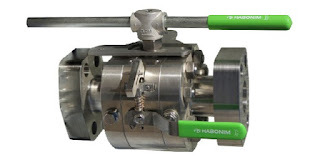 At various points along the distribution path, valves will be needed to regulate or direct flow and isolate portions of the system for safety or service. Emergency shutdown valves must be configured and installed to provide failure-proof reliability when called upon to operate. Transportation containers and equipment will utilize specialized valves adapted for the pressure, temperature, and reliability requirements of the application and industry. Additionally, some may need to survive fire conditions without failure. Fueling stations for compressed natural gas employ valves that will endure cold temperatures produced by gas expansion, plus dynamic pressure cycling. Bubble tight shutoff is necessary to maintain safety. Liquified natural gas (LNG) presents many of the same application challenges as pressurized gas, with the added element of cryogenic temperatures. All of these applications can be adequately served with a properly selected and configured valve and actuator. Share your fluid flow control and valve challenges of all types with application specialists. The combination of your process knowledge and experience with their product application expertise will produce an effective solution. Industrial Valves for Gas Distribution, CNG, LNG from Miller Energy, Inc.